Within the framework of its activities, the POPULISMUS research project has organized a three-day international methodological workshop aiming at an in-depth exploration of theoretical, methodological and analytical issues related to the analysis of populist discourse. The workshop took place at the Aristotle University Research Dissemination Centre from the 11th to the 13th of July 2014 with the participation of international and Greek scholars specializing in the area of the project and its methodology. Yannis Stavrakakis (Aristotle University of Thessaloniki, PI of the POPULISMUS project) opened the workshop with the first orientation session, where he laid out the aims, methods and scope of the POPULISMUS project in a detailed presentation. His presentation included a brief review of the relevant literature, a historical account of the populist phenomenon (from the 19th century onwards) in all its complexity and variability, and finally some proposals that aimed at overcoming the theoretical and analytical impasses affecting current research. Following this introductory lecture, the first panel focused on linguistic and corpora-based methods of discourse analysis that could contribute in the empirical study of populist discourse. Periklis Politis (Aristotle University of Thessaloniki) offered an overview of corpus linguistics techniques and presented the advantages of an empirical bottom-up approach based on verbal and/or multimodal material. On a very similar track, Titika Dimitroulia and Dionysis Goutsos (Aristotle University of Thessaloniki and University of Athens) offered an introduction to corpora and corpus linguistics as a theoretical approach and a research method for the social sciences. Their theoretical presentation was enhanced with an empirical application of their quantitative method through an example of analysis that concerned populism in Greek-speaking corpora (namely the discourse of Alexis Tsipras, leader of the radical left opposition in Greece, considered to be a prime example of contemporary left-wing populism in Europe). Finally, Eliza Kitis (Aristotle University of Thessaloniki) reflected on what a linguistically inspired discourse analysis can contribute to the analysis of certain words or signifiers when it comes to analyzing public discourses. More specifically, she focused on the word ‘populism’ but also on its Greek ‘equivalent’ term ‘λαϊκισμός’ and its pejorative derivative verb, which is difficult to find in any other language and could be here translated as ‘populize’ (λαϊκίζω). In the second panel the focus shifted from linguistic to post-structuralist methods of discourse analysis. Yannis Karagiannis (University of Crete) tried to offer a synthetic approach that borrowed elements from both Foucauldian and other post-structuralist and critical orientations of social research. Yannis Pechtelidis (University of Thessaly) presented an empirical examination of the conceptualization of the Greek ‘youth’ as a ‘subjects at risk’, by focusing on two prominent newspapers, one leaning to the left and one leaning to the right, through a methodological framework that combined Foucault’s method with the innovations of the ‘Essex School’ of discourse analysis as well as youth studies. Yvonne Kosma (American College of Thessaloniki) closed the panel with a practical application of the Foucauldian method of discourse analysis in the analysis of film, also drawing inspiration and additional theoretical/analytical tools from cultural studies. This first day of the workshop was concluded with the second orientation session where Jason Glynos (Essex University) presented his ‘logics approach’ as a method of critical analysis inspired by the post-structuralist tradition, that combines both theoretical rigour and clarity and the potential for empirical application. After advancing his theoretical argument, he moved on to examine the UK financial crisis and reform process in order to illustrate the merits of what he termed a ‘nodal framework’. The second day of the workshop kicked off with a keynote lecture by the founding figure of the Essex School of discourse analysis, Chantal Mouffe (University of Westminster), where she advanced her arguments on ‘the crisis of representative democracy and the need for a left-wing populism’. Mouffe drew on her previous work on contemporary democratic systems in the Western world and on the elaboration of notions such as ‘consensus’, ‘post-politics’ and ‘passions’, to conclude that in today’s post-democratic systems a form of democratic left-wing populist movement could be a crucial factor in re-invigorating democratic politics. In particular, she stressed that mainstream political parties of the centre-left and centre-right have converged today to such a point that it has become difficult for the people to find any difference between their programmes. In this context, right-wing populist parties, like Front National in France, can present themselves as the only real alternative, as the only ones that seek to represent the ‘voice of the people’. According to Mouffe, this can only be counter-balanced through the formulation of a left-wing populist project that would aim at radicalizing (but not dismissing) liberal democracy. She further stressed that recent movements in the European periphery (especially the indignados in Spain and the aganaktismenoi in Greece) could have been more successful if actively linked with institutional politics and specific parties of the left. The third panel aimed at highlighting the empirical applicability of the ‘Essex School’ of discourse analysis and also of the Barthesian method in a variety of fields. First, Thomas Siomos (Aristotle University of Thessaloniki) presented a paper on ‘crisis discourse and media-populism’, where he first focused on the various narratives that emerge in times of crisis using as an example the case of contemporary Greece, and then moved on to further reflect on the notion of ‘media-populism’. Antonis Galanopoulos (Aristotle University of Thessaloniki) drew his tools from the ‘Essex School’ to analyze the discourse of the Democratic Left (DIMAR), a small moderate party of the centre-left in Greece that participated in a government coalition after the 2012 elections. His main finding was that the identity of DIMAR ‘was designed to rely on the populism/anti-populism division, placing the party against populism, while the notion of “responsibility”, which operates as an empty signifier, was used as a point of differentiation from the rest of the Left’. Athena Avgitidou (Aristotle University of Thessaloniki) advanced an approach to hegemonic financial discourses using the work of Roland Barthes, and especially the notions and tools that he develops in his classic book, Mythologies. By focusing on the various narratives developed during the global financial crisis, she concluded that mainstream neoliberal discourse is articulated as a mythical one; a discourse that disavows its contingent nature and political origins to present itself as ‘common sense’. Iraklis Mavridis (Panteion University) concluded the panel by offering some general critical reflections on the relation between discourse analysis and the critique of ideology. The third panel was followed by another orientation session in which Gerasimos Vokos (Aristotle University of Thessaloniki) talked on the ‘emergence of the people’, starting from revolutionary France to move on to the early 19th century and the problems posed to the ruling elites by this ‘disturbing’ emergence. Vokos, in his rich presentation, delved into the constitutive polysemy of ‘the people’ as a collective subject and symbolic reference, highlighting its double nature: ‘a blessing and a curse, a demon and a god, the people can simultaneously be the foundation and a stick of dynamite for social cohesion. The people is dangerous for the state but there can be no state without a people’. Guizot is for Vokos one of the most interesting examples of the efforts of the elites to cope with the problem of popular sovereignty, putting forth dilemmas that seem to retain their significance even for today’s societies. The fourth and the fifth panel, following Vokos’ remarks on the polysemy of the democratic collective subject, delved into the various conceptions of collective subjectivity, that range from ‘the people’ to the ‘multitude’ and from the ‘masses’ to the ‘nation’ and ‘civil society’. Fani Giannousi (Aristotle University of Thessaloniki) went back to 18th and 19th century discussions in order to locate the roots of today’s stakes and ambiguities. Andreas Takis (Aristotle University of Thessaloniki) focused on Hardt and Negri’s notion of the ‘multitude’ as a discursive form rivalling that of ‘the people’, to conclude that the multitude ‘stands as a non-represented and non-representable entity of our political ontology and finds its empirical expression in situations of structural political crisis’; something that renders it necessarily elusive and liminal: a transitory part of a choreography that ultimately leads to the constitution of the democratic ‘people’. Aris Stylianou (Aristotle University of Thessaloniki) followed Takis’s presentation, starting also from Hardt and Negri’s project to move onto Etienne Balibar’s work on the ‘masses’ in order to trace adequate answers to the questions posed by the contemporary theorists of the multitude. Aggelos Gounopoulos (Aristotle University of Thessaloniki) focused on the conceptualization of the subject of the ‘poor people’ in Liberation Theology in Latin America and the distinct type of populism their discourse seems to represent. Akritas Kaidatzis (Aristotle University of Thessaloniki) shifted the focus onto the notion of ‘populist constitutionalism’ to argue that ‘the people not only act as the constituent power (only to disappear thereafter) but they also shape, through the course of everyday politics, the way the constituted powers apply and interpret the constitution’. In his presentation, Alexandros Kioupkiolis (Aristotle University of Thessaloniki) highlighted the importance of the politics of hegemony, as understood by Ernesto Laclau, Chantal Mouffe and the ‘Essex School’, in analyzing democratic politics and collective action today, addressing objections that usually stem from theorists that advocate post-hegemonic and/or horizontal conceptions of democratic agency. Fotini Tsibiridou and Michalis Bartsidis (University of Macedonia and Aristotle University of Thessaloniki) reflected on a positive conception of populism, drawing on anthropological and philosophical approaches to unravel the significance of the ‘popular’ in Greece from the 1980s onwards. Yannis Skalidakis (Aristotle University of Thessaloniki) offered a historical twist to the discussion on popular identity, through an examination of the ways in which the Greek Resistance movement during the occupation of Greece by the Axis powers, as it was organised around EAM (National Liberation Front), articulated in its discourse a vast social alliance through the interpellation of ‘people’s kratos’ (‘laokratia’, a term difficult to translate into English). The last day of the workshop opened with an orientation session by Ryan Brading (SOAS), who tried to comparatively asses two very different instances of social and political mobilization that he regards as populist; on the one hand the Bolivarian project of Hugo Chavez in Venezuela, and, on the other, the recent impressive electoral success of the anti-European and xenophobic party UKIP and Nigel Farage in the United Kingdom. The sixth panel followed on a comparative track, with case studies that ranged from the extreme right to the radical Left, and from religious discourse in contemporary Greece to anti-populism in post-1989 Bulgaria. Anastasia Iliadeli (Aristotle University of Thessaloniki) reviewed various existing approaches on the extreme-right phenomenon in Europe to finally highlight the most important populist features that are embedded in this particular party family. Konstantinos Papastathis (University of Luxembourg) drew on Cas Mudde’s ‘pathological normalcy’ thesis to critically explore the ideological relationship between the Greek Church and the extremist neo-Nazi party, Golden Dawn. 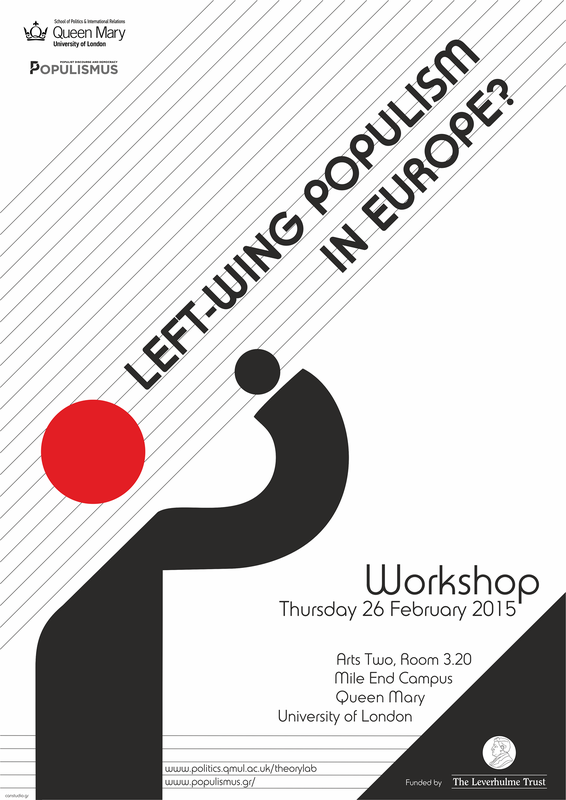 Giorgos Katsambekis (Aristotle University of Thessaloniki) brought the attention to the emergence of a populist radical left in Europe that destabilizes various existing theoretical/analytical models on populism that tend to equate it with nationalist, xenophobic and anti-European tendencies. He stressed that it is through a discursive framework that we should register the latest developments in populist politics and comparatively assess the significance of every case in a way that is both theoretically consistent and analytically operational. Finally, Georgi Medarov (University of Sofia) focused on the articulation of an ‘anti-populist’ discourse by Bulgaria’s liberal elites and argued that an opposition to ‘the people’ and a fear of the democratic ‘excesses’ from bellow ‘was formative for the constitution of liberal subjectivities in post-socialist Bulgaria’. The last panel was dedicated to cleavage theories and quantitative methods of analysis. Christoforos Verdardakis (Aristotle University of Thessaloniki) illustrated the importance of the notion of ‘cleavages’ and their potential for empirical research through an examination of the Greek elections during the last twenty five years, while Theodoros Chadjipantelis and Tassos Varellas (Aristotle University of Thessaloniki) offered a general presentation of quantitative methods of social research, mainly correspondence analysis and cluster analysis, using data from the Greek elections and from the surveys for the general population. While their presentation did not tackle directly issues related to populism, they nevertheless developed some hypotheses on the prospects of illuminating populism by incorporating in the relevant studies qualitative methods of analysis and large-scale empirical surveys. In the last orientation session Nikos Demertzis (University of Athens) tried to shed light on the affective dimension of populist identifications. His presentation was mainly targeted at familiarizing the audience with the notions and tools developed within the field of sociology of emotions. The workshop was concluded with an open discussion with the audience chaired by the PI of POPULISMUS, Yannis Stavrakakis, where a fruitful dialogue developed on the future prospects of the research programme and on the study of populism and democracy in general. Overall, the workshop, which was attended by one hundred participants, kicked off a set of POPULISMUS public events that will include a series of individual lectures as well as a major international conference in 26-28 June 2015.